Details: Seven powder bowls and summit-to-base groomed slopes are but two of the features on the hill at Alpine Meadows, a resort that receives 450 inches of annual snowfall. Thirteen lifts give skiers and riders access to more than 100 trails across 2,400 skiable acres. Alpine was combined with neighboring Squaw Valley under common ownership in November 2011. New for 2012-13: The terrain park will be a mile-long experience, the longest in the Lake Tahoe region. Also, there will be a beginner progression park on Subway, where lessons will be available. The base area jib arena will have several new features: four beginner boxes, two intermediate boxes and four snowmaking pipe jibs. Guests enjoying a meal on the sundeck will have a great view of skiers and riders in the expanded arena. Best lift deal: The dual-mountain “superpass,” starting at $429, offers access to Alpine Meadows and Squaw Valley. Information: www.tahoesuperpass.com. Other deals will be announced during the season. Snowmaking: Covers a network of runs served by 11 of the resort’s 13 lifts. After dark: No night skiing/riding. Spotted last season: Alpine and the adjacent Squaw Valley are both playgrounds for Robin Williams. Where to stay: Olympic Valley has a host of options for accommodations, many of them offering specials for lodging and lift tickets. 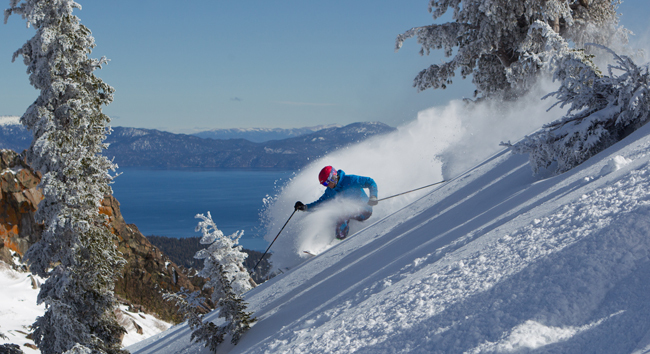 Information: 800-545-4350, www.squaw.com/trip-planning/vacation-packages. The Village at Squaw Valley (www.squaw.com/the-village/lodging), at the neighboring Squaw Valley resort, is one of those options. A free shuttle service connects the two resorts. Eats at the resort: Meadows Café in Main Lodge is known for great breakfast selections. Made-to-order salads are an option for later in the day. The Last Chair Bar, also in Main Lodge, has paninis, nachos and other bar food to go with micro brews, specialty cocktails and other selections. Eats nearby: River Ranch Lodge & Restaurant (530-583-4264, www.riverranchlodge.com), located on the Truckee River at the base of Alpine, is popular with locals and visitors alike. The restaurant celebrated its 40th anniversary this year, and the specialties created by Executive Chef Julia Walter and her staff include the organic Sonoma Chicken and Wild Game Meat Loaf (with venison and pork). Après-snow hotspots: The Last Chair Bar (for details, see Eats at the Resort) and the Ice Bar, at the base of the Sherwood run on the backside of Alpine. The Ice Bar typically opens in January with a celebratory bash, and parties are scheduled throughout the season. Dining options include barbecued bratwurst and grilled chicken sandwiches, served with bottled micro-brews and soft drinks.